Half Day Camp runs Monday through Thursday, 10am to noon and are designed for boys & girls between the ages of 6-11. All ability levels are welcome. 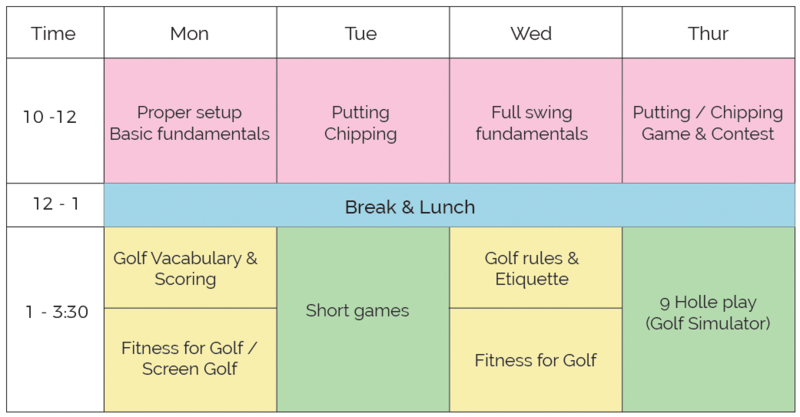 Half day camp are designed for new golfer as well as the intermediate level. Paticipants are segmented into smaller groups based on their experience and skill level. Full Day Camp runs Monday through Thursday , 10 am to 3 pm and designed for intermediate and advanced level golfers between the ages of 7 -14. Paticipants are segmented into smaller groups based on their experience and skill level. Fitness is an hour long and will consist of improving the Camper's natural physique with the use of drills, activities, lifts, and circuits.